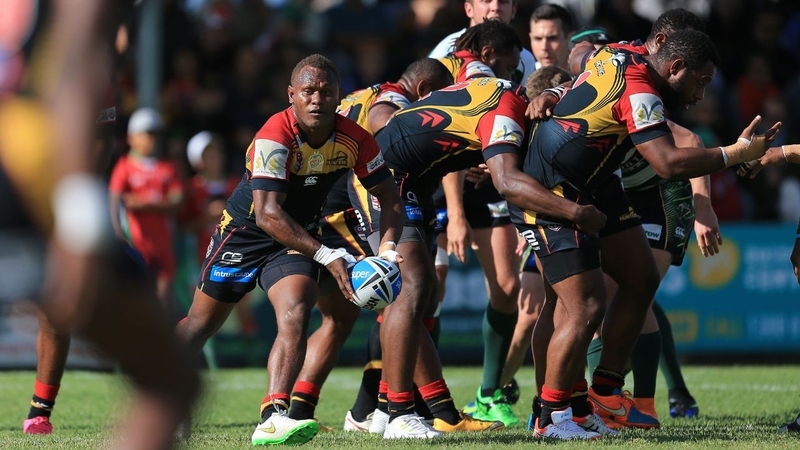 Five debutants have been named in the PNG LNG Kumuls side for the Pacific Test against Fiji Batis on Saturday May 7, 2016 in Sydney. Justin Olam selected as winger becomes Kumul No. 274. Stargroth Amean (275) has been selected on the other wing. Watson Boas (276) gets the nod at halfback and partners brother Ase (248) who made his debut and only appearance for the Kumuls against France in Hull, England during the 2013 World Cup as halfback. Henry Noki (277) whose performance in the Intrust Super Cup this season has been outstanding will make his debut as prop. While the PNG Hunters dominate the selections - the Intrust Super Cup is well represented with Willie Minoga, Rhys Martin (Townsville) and Luke Page (Burleigh Bears) also selected. Canberra Raiders Kurt Baptiste (278) has been named on the bench. Coach Michael Marum (197) said a captain and vice-captain will be named later in the week. The support staff to Marum include former Kumuls Arnold Krewanty (105) and Marcus Bai (176) as co -team mangers, head trainer is Solomon Kuluniasi and will be assisted by John Wilshire (186) and David Westley (172). Stanley Tepend (198) and Leonard Tarum will attend the Test match as observers. The 18-man team will assemble in Penrith west of Sydney on Monday, May 2 where they will undergo medical tests. Marum said four shadow players have been named as standby should any of the 18-man squad suffer injuries or face judiciary charges after this weekend. The Pacific Test against Fiji Batis will be played at Parramatta Stadium on Saturday May 7, 2016. All players will return to their respective clubs on Sunday May 8.